Spent an hour and a half getting throughly confused yesterday in Paugaussett SF. 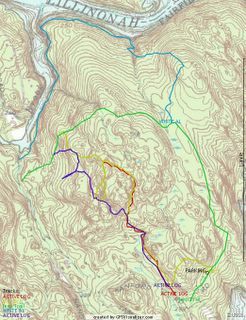 Rode the blue trail from the parking lot (olive green) at the entrance that intersects with an old Jeep trail (Blue & Red) on the eastern boundary. Interesting little ride that consists of two hike-a-bikes (the art of dismounting one's ride and pushing, carrying, schlepping, up a hill that is too steep to climb peddling, or if one is just too tired to do so), one was up a ledge along a little cliff. I felt like Lassie and little Timmie was trying to coax me up to safety. Between the hike-a-bikes is a beautiful right of way (ROW) from days gone past. Both sides are edged with 4 foot stone walls. Unfortunately, there are too many trees down to make it passable. This ROW is the one that runs from Albert's Hill/Al's Trail intersection up past the house at the start of the SF and into it the woods (SF) proper. It's probably how the farmer(s) moved livestock and wagons into the area for farming. Acording to the maps I have seen, at one point it just stops which makes me think that it was the route to fields. So, heading down hill I hit the old jeep/logging trail which starts on Sandford Road, so I guess this means it turns into the blue trail. There is a branch off which is marked with blue/pink engineer tape (olive & red), that I rode a couple of weeks ago. This trails appears to be a cut-off from the blue trail that gets around some really nasty climbing (yes, more hike-a-bike). I wonder if this might have been put in by a fellow rider. When I intersected with blue trail again, I went south to see where this goes and found that it climbs to the top of one of the highest points in the SF and then drops sickenly down (hence the by-pass maybe). Picked up the blue/pink again and found that it bypasses this steep climb another way, too. So, is the purpose of the blue/pink just to get around this steep part or what? So I followed the other blue/pink cut-off back up the hill, picked up the blue, rode past where I the other cut-off intersects with the blue to where the blue turns due west towards the exit of the forest. At that point, there is a trail marked with pink tape that cuts over to the main Jeep trail. There were more blue markers headed into the woods in the direction of the Pond Book Boat ramp and Al's trail but after 100 yards I lost the trail and headed back. I did find a nice camping area with a fire ring. Getting back to the Jeep Trail (green) for the final down hill ride and the ride was done. The upper part of the blue trail shown on the map above, starting where it breaks off from the olive trail was indeed a trail that lead straight into someone's back yard. I recorded this track on my GPS the first time I rode the eastern side of the state forest. Rather than back track to find the trail I should have been on, I bushwhacked until I found the blue blazed trail which led me down to the jeep trail and out of the forest. Bushwhack riding is challenging. Also, I have captured part of Al's Trail (tourquoise). Three quarters of the way, where it does a 90 degree turn and heads due south is a white blazed trail that hooks up with another blue trail (engineer tape) that leads to the Jeep Trail.